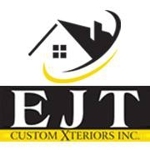 EJT Custom Exteriors Inc. is a reputable roofing contractor offering emergency roofing services to customers in south Jersey and the surrounding areas. We specialize in asphalt roofing, shingle roofing, general roofing services and more. Our experienced contractors use the latest equipment and tools for all their roofing jobs. Whether you need to replace your existing roof or install a new one, we have got you covered. We specialize in the repair and replacement of roofs, decks, doors and windows. Our experts are committed to providing quality services at affordable rates. No job is too big or small for us. For more information, call us today at (609) 270-1972.